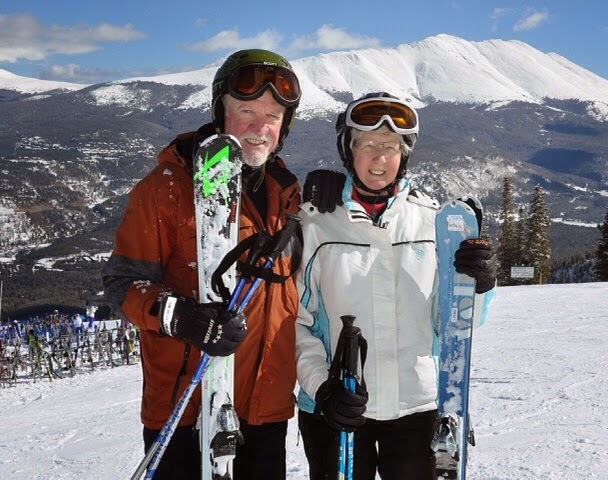 Apologies for this posting if you are not a skier, or if you have no intention of ever visiting Breckenridge in Colorado, where Barbara and I spent 10 nights prior to the SME in Denver. 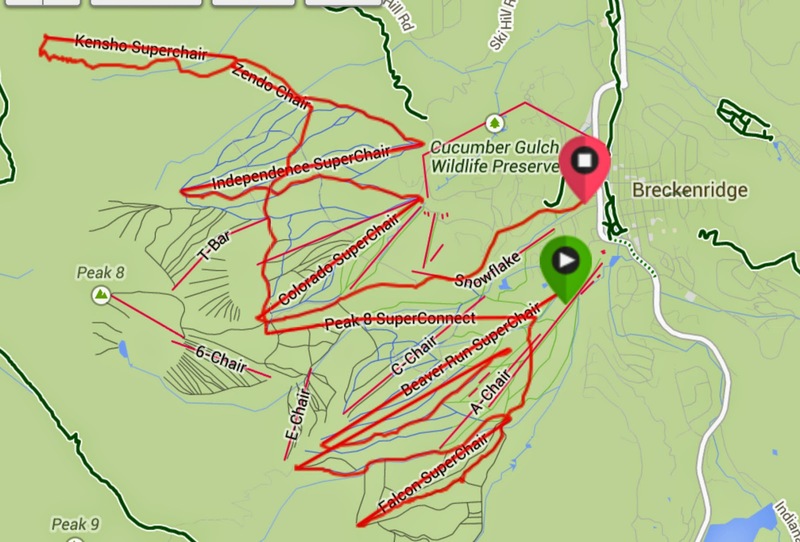 If you are a skier then put Brecks on your list. It has something for everyone, very demanding double-black runs in steep bowls, and acres of well groomed blue and green runs for the intermediates and beginners. 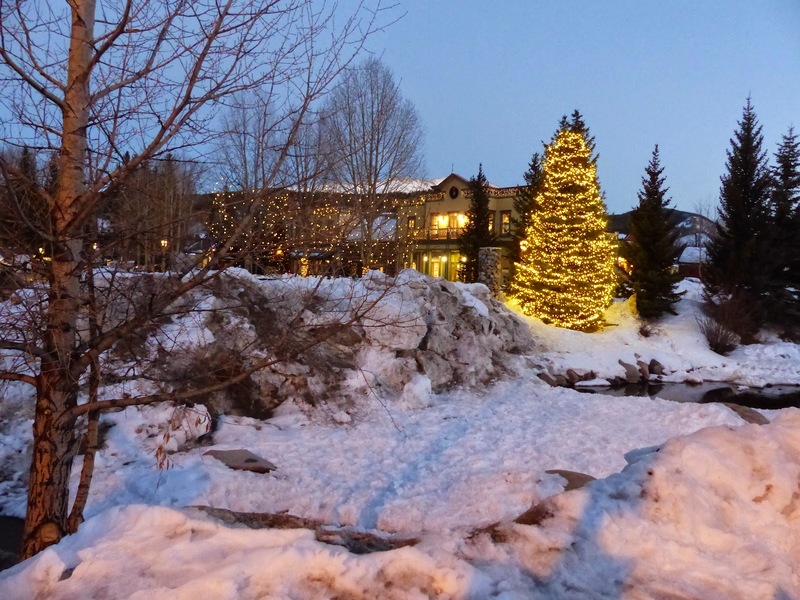 We have been eight times now, and although it can be very cold due to the high altitude (the town is at 9600 ft), the snow is as good as it gets, better in my opinion than in the much-hyped Utah, and much more reliable than in Europe. 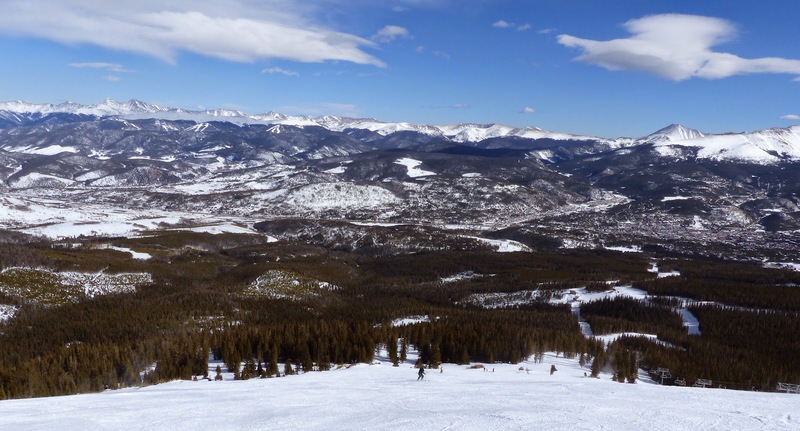 The huge area consists of 187 trails on five interlinked peaks, and for the benefit of newcomers to the area, I have put together an easy itinerary which covers each peak, uses only 8 lifts, and never the same lift twice. The route starts at Beaver Run near the base of Peak 9, which can be accessed by one of the many free ski buses from town. 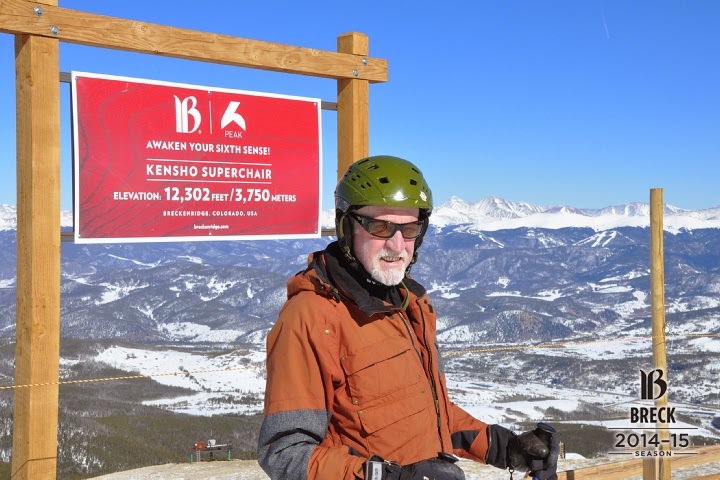 Take the Beaver Run Superchair, then drop down to the Mercury Superchair, where you follow the signs to the Falcon Superchair, which takes you up Peak 10. The runs down Peak 10 are fairly easy blacks, and a few challenging double-blacks, and lead down to the Peak 8 SuperConnect Chair, from where you take the long traverse to Peak 7 and then follow the signs to Peak 6 for the Zendo Chair and the Kensho Superchair, which takes you up to the highest point on this route, just over 12,300 ft on Peak 6 for some great bowl skiing. From here it is a long and glorious descent to the base of Peak 7 and the Independence Superchair, from where you take one of the many trails down to the Peak 8 base. From here take the Colorado Superchair up Peak 8, and then descend all the way to Main Street in town via the Four O'Clock run. 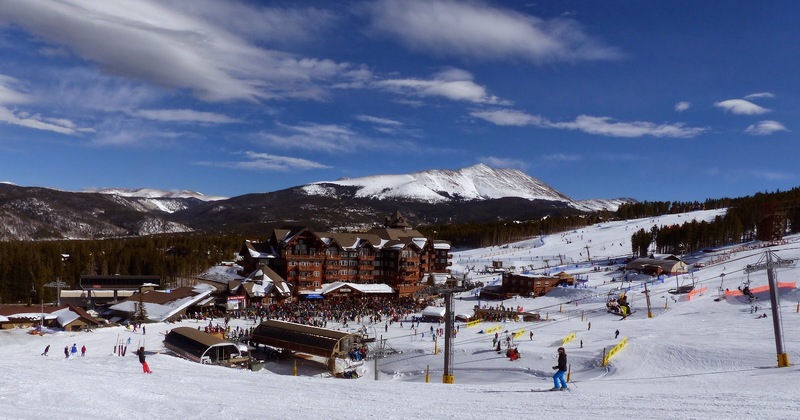 You will have covered 23 miles of terrain with a vertical descent of around 10,500 ft, and will be ready to explore all the other options that Breckenridge has to offer. Enjoy! Size Analysis on your smartphone- too good to be true? Has anyone tried the RHEWUM SizeChecker App, which is now freely available at the App Store? Apparently the new SizeChecker App enables you to determine the size distribution of particles by using the camera of your smartphone. Via the picture of the particles of interest you will receive all important information on the grain size distribution. If you have tried it, let us know your views. I missed this month's Cornwall Mining Sundowner, which was held for the first time at Tyacks Hotel in Camborne. CSM's Steve Pendray has emailed this photo with, left to right, Nick Le Boutillier, Nick Eastwood, Bentley Orchard, Jackie Thornton, Carol Richards, Robin Dunn, Steve Pendray, Nick Wilshaw and Tony Thornton. 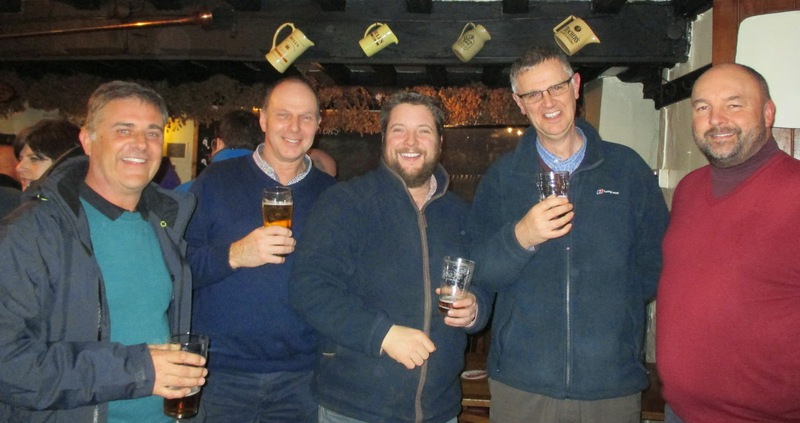 And Charlie Northfield, of Wolf Minerals' Drakelands Mine, has sent me this photo taken at the Devon Mining Sundowner, earlier in the month at Hemerdon. Left to right are Mark Cox, Tony Delany, Henry Chalcraft, Dave Howourth and Andrew Harry. While in Denver last week, I was saddened to hear of the untimely death of Dr. John Meech, who for 26 years had been a valued member of the Department of Mining and Mineral Processing Engineering at the University of British Columbia, Canada. A graduate of McGill University and Queen's University, Dr. Meech spent 4 years in Zambia with Roan Consolidated Mines Ltd working on R&D projects in milling and smelting. 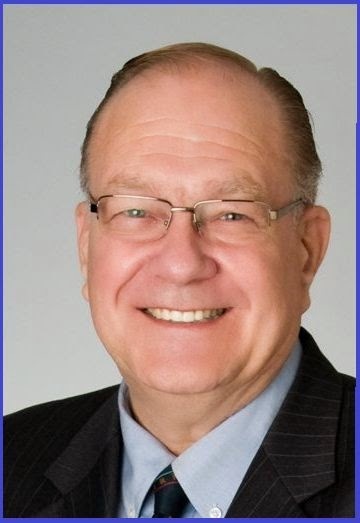 In 1974, he joined the Mining Department at Queen's University, Kingston, Ontario where he conducted research on flotation; processing copper and gold ores; iron ore beneficiation; environmental control and simulation modelling for process control. The last topic evolved into a keen interest in the use and development of Industrial Expert Systems. Dr. Meech joined the University of British Columbia in 1989, where he continued his work on AI applications. His teaching and professional activities included process control, unit processes and flotation, environmental protection and expert systems and it was his expertise in these areas that led me to invite him to the Editorial Board of Minerals Engineering, on which he served for many years. 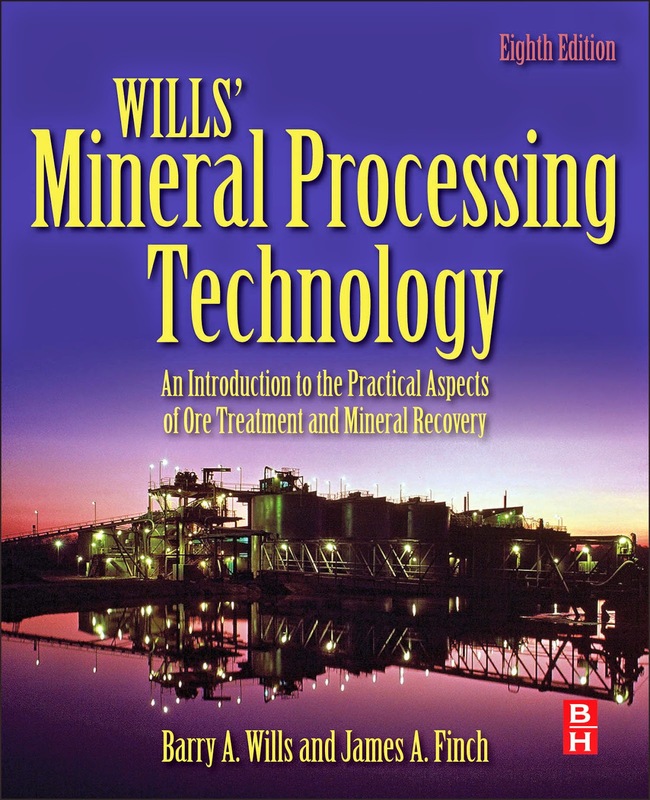 He authored over 100 technical publications on mineral processing and expert systems. He also enjoyed visiting elementary and secondary schools to talk with students about careers in the Mining industry. John was also the Director of CERM3 in the Department of Mining Engineering. CERM3 is the Centre for Environmental Research in Minerals, Metals, and Materials. The centre consists of over 30 faculty researchers that include some of Canada's top environmental scientists and engineers working together to address the critical technical challenges in environmental and social issues faced by the Mining Industry in the 21st Century. Although it is many years since I last saw John, he was Amanda's contact in the organisation of the ill-fated Minerals Engineering '01, which was scheduled to be held in Vancouver in September 2001, in collaboration with UBC. Just a week before the start of the conference 9/11 caused the closure of North American airports, and the event had to be cancelled. 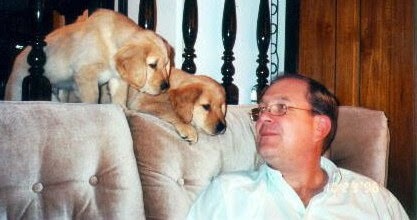 Amanda remembers him as a big, friendly man who shared a common interest with her- the love of their dogs. John passed away on February 9th, and we extend our deepest condolences to his wife Elaine and their sons. Denver is the home of the Society for Mining, Metallurgy and Exploration (SME) and always attracts the highest turnout for the Annual SME Meeting, in no small part due to The Colorado Convention Centre being located in one of America's best downtown locations, with some excellent restaurants and hotels within walking distance. The SME Meeting means different things to different people. For me it is one of the industry's great meeting places, with great networking opportunities. I forsake the technical sessions, so this report is really my diary of my wanderings, mainly around the exhibition area, seeking out familiar and new faces. Mineral processing is but a small part of the overall event, but is the area that I will concentrate on, armed with camera and notebook. Barbara and I attended the official opening of the huge exhibition this afternoon. Last year in Salt Lake City, 539 companies were represented in over 800 exhibition booths, a record, but this year all 900 booths were sold two weeks before the start of the event. The first familiar faces were John and Donna Starkey of Starkey & Associates, Canada, sponsors of Comminution '16. This year will be the 10th anniversary of their SAGDesign technology which has proved successful in several new plant start ups, including Lake Shore Gold in Canada, which was designed exclusively using SAGDesign technology. The company is now focusing on designing and starting up new SAG plants at design tonnage from day one, and has recruited a young mining engineer as Project Manager, Spencer Reeves, a graduate of Queen's University. The huge FLSmidth booth as ever provides a useful landmark, and passing by I heard familiar north of England accents, so stopped by to talk to two pump experts, Jeff Crawford, Global Sales Director and John Frater, Technical Manager, Pumps. I took the opportunity of congratulating John, who this week will be inaugurated into International Mining's Hall of Fame. International Mining is one of two regular media sponsors of MEI Conferences, the other being Industrial Minerals, the latter for many years being represented by Mike O'Driscoll, who is here this year to spread the word about IMFORMED - launched last month as the new platform for networking and knowledge for the global industrial minerals business, founded by Mike and his Industrial Minerals colleague Ismene Clarke (more details on MEI Online). Mike is pictured right at the International Mining booth with Paul Moore, Robert Pell and Phil Playle. Browsing the booths I bumped into Vishal Gupta, formerly with FLSmidth, and now with EP Minerals, USA. He is a regular Minerals Engineering reviewer and is pictured right, below, with Rajesh Raitani of Cytec. This is JKTech's 26th SME conference. The Australian company is here to build new relationships and maintain old ones. As well as the booth, which is manned full time by their North American representative Mark Richardson, they have already run a two day workshop on 14 and 15 February on Mine to Mill Optimisation. This was presented by Sarma Kanchibotla, of JKMRC and Sebastian Tello of JKTech Chile. After this brief sojourn around the exhibition, we enjoyed an excellent meal at Earl's Restaurant on the 16th Street Mall. How the weather changes dramatically in Denver. When we arrived two days ago people were walking around in shorts and T-shirts, basking in the 21C temperature. Today snow is falling heavily and the temperature has fallen to 1C! While waiting for the exhibition to open I caught up with three members of the Hazen Research team, based at nearby Golden, Director Nick Hazen, Christel Bemelmans and Hanna Horsch, a valued member of the Minerals Engineering review panel. It was also good to see my old friend Guven Onal, of Istanbul Technical University, accompanied by his son Erden, and with James Hendrix of Mackay School of Mines. I also had coffee with Sweden's representative on the Editorial Board of Minerals Engineering, Bertil Palsson of Lulea University, who will receive the Arthur F. Taggart Award on Wednesday for his, and three co-authors', paper in Minerals and Metallurgical Processing on the validation of tumbling mill charge- induced torque as predicted by simulation. And so into the exhibition and my first stop at the Cytec booth to photograph some of their large group representing the company at the SME in this their centenary year. Another large group are representing Metso, sponsors of Flotation '15. Another Flotation '15 sponsor is FLSmidth, and I looked in on their booth again, where Dariusz Lelinski (left) and Asa Weber showed me the nextSTEP rotor/stator mechanism, said to provide a “step change” in flotation metallurgical performance and energy efficiency. The mechanism is described in more detail in MEI Online. Eriez is also very much involved with flotation these days, and I called by for a demonstration of their column flotation cell. Their Flotation Division is the leading supplier of flotation columns, with an installed base of over 1000 columns. In the photo below Jaisen Kohmuench, Deputy Director for the USA (far left) is explaining to me how a 3 inch diameter lab-scale column flotation works, watched by Global Managing Director Eric Wasmund. Osvaldo Bascur was last year's recipient of the SME's prestigious Antoine Gaudin Award. He is with OSIsoft, which is featuring new tools for costs savings through the automatic capture of minor equipment-production delays and the estimation of energy and water losses for mineral and metallurgical operations. After lunch the Mineral Processing Division Awards lectures were presented. This year's Richards Award recipient was Rick Honaker of the University of Kentucky, the Wadsworth Award lecture was by David George of Rio Tinto, Utah and the Gaudin Award lecture by Phil Walker from Winnemucca. Then back to the hotel, to get free internet access rather than pay the exorbitant $80 daily rate offered to delegates by the Convention Centre. Looked in at the Bookshop this morning, and pleased to see that Mineral Processing Technology is still a readers' choice. Next year, however, it will be replaced by the 8th edition, currently being edited by Jim Finch and his team at McGill. 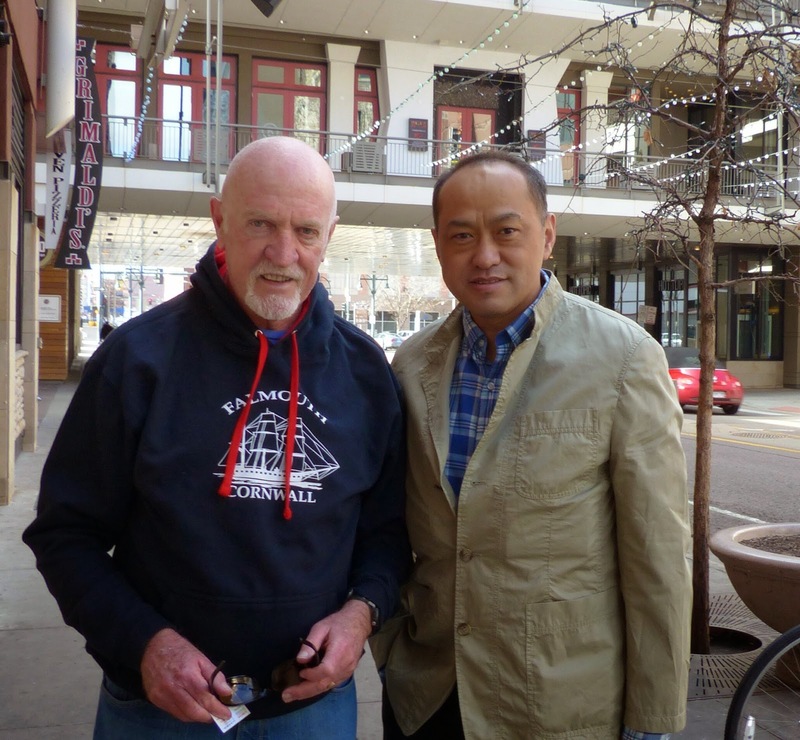 I met up with Jim this morning to discuss progress, and we hope to launch the book at Flotation '15 in November. We also talked about MEI's involvement in next year's IMPC in Quebec City, for which Jim is Chairman. I saw Jim again later talking to Joseph Lessard of Orchard Material Technology, who recently published an excellent paper on the economic impact of ore sorting in a comminution circuit in Minerals Engineering (posting of 8 Sept 2014). Joseph intends to present more work on this increasingly important technology at Physical Separation '15 in June. Ore sorting represents a future direction for the mining industry as it seeks to reduce costs associated with comminution, waste handling, and mining. Steinert, who provides state-of-the-art sorting equipment and sophisticated magnetic separation technology, is now working with OMT to generate a more complete picture of the economic ramifications (i.e. capital, operating, and maintenance costs) associated with bringing sorting to existing processes. I looked in at the mineral processing sessions and bumped into Paul Gottlieb, formerly with FEI, now Business Development Manager with Czech company Tescan Orsay Holdings, who sponsored last year's Process Mineralogy '14 conference. Paul has recently relocated from Brisbane to Brno to become Tescan’s Product Marketing Manager - TIMA. He was unhappy that he had just missed an important paper, as a no-show had caused a major change in the timetable. Probably best if I do not get too involved with my opinions of SME parallel sessions and timetabling! I strolled over to the Tescan booth with Paul to see the Tescan Integrated Mineral Analyser (TIMA), a new generation of very rapid SEM based Automated Mineralogy (AM) systems in which the SEM and x-ray detector systems are fully integrated through proprietary hardware and software. There was much activity at the FLSmidth booth where Frank Traczyk was making a presentation on the nextSTEP rotor/stator mechanism that was described to me yesterday. The device was designed at Virginia Tech by Roe-Hoan Yoon's flotation group, consisting of two fluid mechanists (Saad Ragab and Demetri Telionis) and two flotation scientists (Jerry Luttrell and Roe-Hoan Yoon) and a number of graduate students, with input from FLSmidth in-house researchers and practitioners. A great example of cooperation between academia and industry. Nearby I caught up with Sam Sutherland of Univar. At the booth Kris Strickland of ArrMaz was talking to Patrick Norman, Univar Eastern Region Manager, Canada and Sam, Vice President Global Mining. Just before lunch I looked in at the giant Scheider Electric booth. Invensys, now a part of Schneider Electric, works in partnership with a broad range of industrial and commercial customers, including operations such as comminution and flotation, to design and supply advanced technologies, their software systems and controls enabling users to monitor, control and automate critical and demanding processes. After lunch I dropped by the RSG Inc booth to find out what was new from my old friend Chris Martin. RSG has introduced its largest ufg-mill to date. The ufg400 is a 400 HP (265 kw) dry media mill, designed for ultrafine grinding of industrial minerals. The ufg400 coupled with ACS-200TD air classifier will produce 3 tph of 2.5 micron dolomite and is to be installed in Pennsylvania later this year. In the evening we attended the International Reception at the Hyatt Hotel, a good opportunity to relax with overseas (ie non-USA) delegates and partners, followed by a very disappointing curry at the nearby Little India Restaurant. The last morning of the SME is always relaxing, time for a last chance to stroll around the exhibits hoping to catch up with people who you may have missed. It was good to meet Pete Dunn and Bill Weldon of Mineral Technologies. Bill will be in Falmouth in June to present a paper on a new mineral sands development in Georgia at Physical Separation '15, and looks forward to the visit to the old tin and copper mines during the conference. Also good to catch the team from Huntsman, sponsors of Flotation '15. Bruker is one of the early sponsors of Process Mineralogy '17, and Karsten Knorr and his team were displaying the D2 Phaser, a bench-top XRD for minerals identification and quantification. In the next booth Omar Arafat of Metcom Technologies was talking to Edward Duda of Freeport-McMoran Copper & Gold. Finally I called in at the SME office to congratulate the team on an excellent convention, which provided superb networking opportunities. The Membership team are pictured left, Billie Emas, Mona Vandervoort and Angie Grace. They tell me that over 7800 delegates registered for this year's event. Next year the SME Meeting will be held in Phoenix from February 21st-24th. I intend to be there! A cold, crisp day in Denver, a mere 20C cooler than when we arrived yesterday! After registering for the SME Meeting early morning we took our usual stroll up and down the 16th Street Mall, where we usually see a number of familiar faces. But this year the only person we met was Yang ZhiYong, President of Florrea Mining Chemicals, China, a regular at MEI's Flotation conferences. What was very noticeable this year was the very high number of homeless people begging on the Mall, which tells its own story. After lunch at our hotel, the Crowne Plaza, we were back to the nearby Colorado Convention Centre for the opening of the exhibition. I will post regular short updates during the week on Twitter (@barrywills #SME2015ACE) and my diary of events with photos will be published on the blog on Friday. 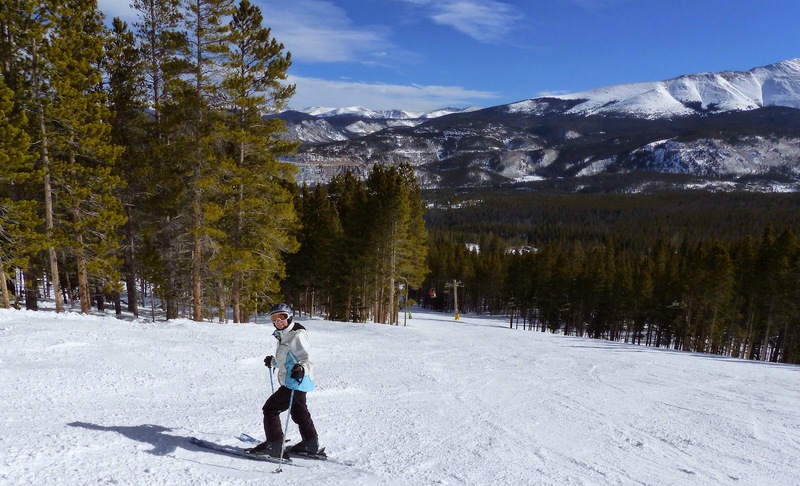 Acclimatising for the SME Meeting in Denver at 1600 m, Barbara and I are in our favourite American town, Breckenridge, Colorado, at an altitude of 2926 m (9600 ft). 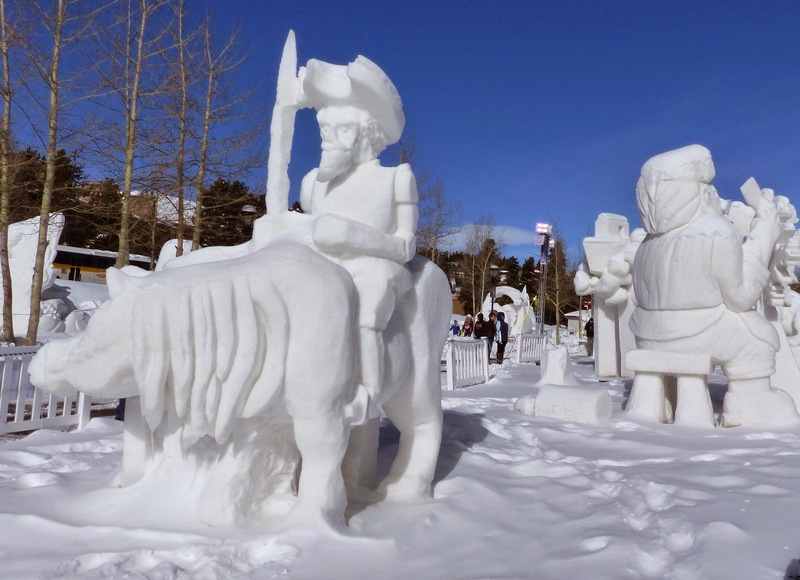 Famous now as an alpine ski resort, Breckenridge was founded in 1859 to serve the miners working rich placer gold deposits discovered along the Blue River, a tributary of the Colorado River. Placer gold mining was soon joined by hard rock mining, as prospectors followed the gold to its source veins in the hills. Gold production decreased in the late 1800s, but revived in 1908 by gold dredging operations along the Blue River and Swan River. 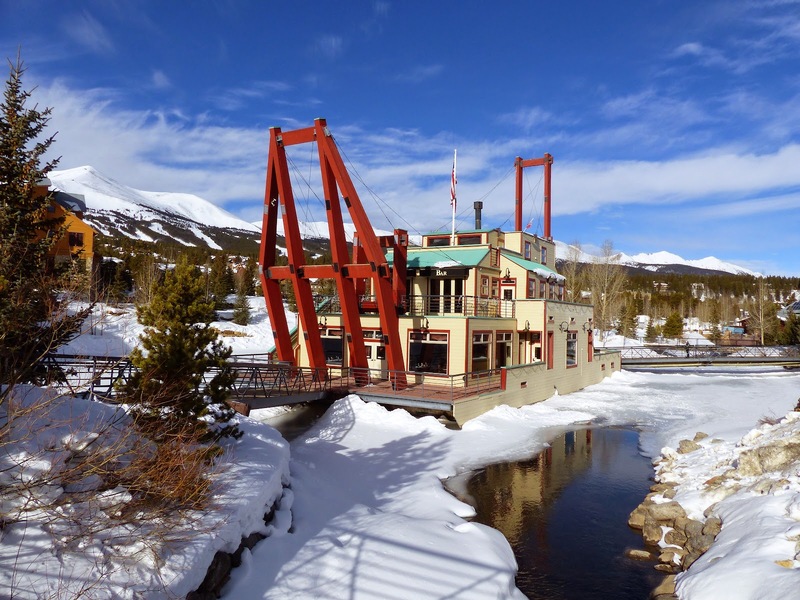 The Breckenridge mining district is credited with production of about 31,000 kg of gold. 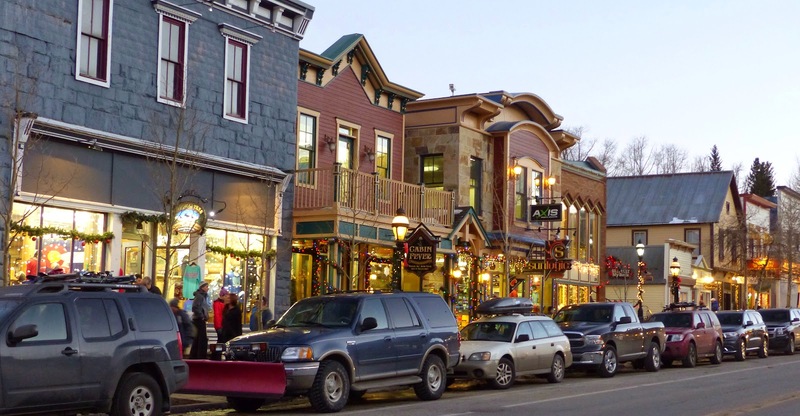 Just west of the Continental Divide in Summit County, Breckenridge is one of the most visited ski resorts in the western hemisphere, and its Main Street still has the atmosphere of an old mining town, with its buildings which have stood for over 100 years. And it has great restaurants with, unheard of in America, not a McDonalds in sight! We had perfect skiing conditions during our 10 nights in 'Brecks', and our 8th visit to this great town.